Sweet baby D and I recently had the chance to attend an event hosted by Smucker’s, a ‘bookworm brunch’ they called it. Since the little man LOVES reading like nobody’s business, I thought it’d be a fun opportunity to get us out and about. 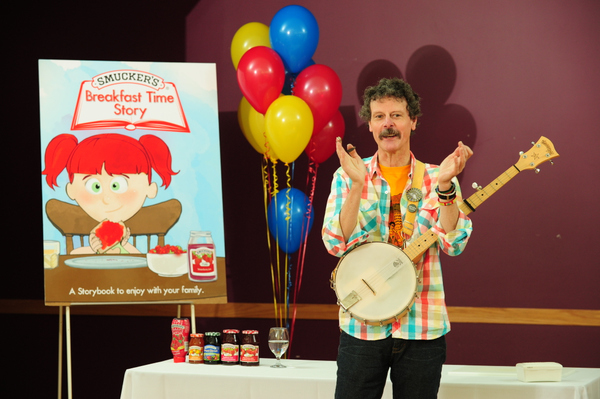 We were treated to some tasty breakfast recipes using their products, as well as a lively story time session featuring a blast from my past, author Ted Staunton. You see, I went to grade school with Ted’s son many moons ago. I might even go so far as to say that Ted fostered my first real attempt at writing, while volunteering to lead a class project for some of the students to make their own books. I remember not long after, I penned my first play, about a leprechaun named Lucky and his woodland friends. It was performed for my Grade 3 class, and I was ridiculed for the rest of my elementary school career. Alas, back to the bookworm brunch. So, Smucker’s has launched this really cool contest, with Ted’s help, where your family can win a personalized storybook written by Ted! All you have to do is visit the Smucker’s website and fill out an entry form. The Breakfast Time Story contest runs until August 9th is open to all legal residents of Canada, excluding Quebec. While you’re at it, here are a few of Ted’s tips for work story time into your day with you little ones and foster their love of the printed word. Remember that it’s never too early to start reading and sharing stories with your kids. Encourage story time at the breakfast table by having your kids share their funny dreams from the night before. Encourage kids to share their favourite stories about their day in the car, on walks or at the dinner table – and don’t forget to share yours too. Ask children to read the name of street signs, businesses or even posters as an activity during walks, in the mall or at the grocery store. Appoint them navigator. Have your child help you make a family meal by reading the recipe and then following the instructions. Visit the library. The library is packed with wonderful stories that entice even the most creative of young imaginations. Take advantage of this resource in your community and let your children see you sign out books too – like-parent, like-child! Get creative with meals and make their favourite story book characters out of a much-loved food. Read with your child every day. It’s like breakfast – it shouldn’t be skipped! Choose what you are going to read together as it gives children the ability to pick stories that interest them the most. Reading will be perceived as a fun activity rather than something that requires work.